Nuova versione per Dojo Rumble, simpatico picchiaduro in cui è possibile creare catene per aumentare la combo. While busy doing all kinds of stuff I somehow quite spontaneously decided to go back and polish Dojo Rumble some more. Previously soundless, it now not only features sound, but also some kickin' tunes, a few updated sprites and a new 'endless' mode. Also new is a small reward for finishing easy or badass mode: namely, a red outfit with matching rumbling-red shurikens. 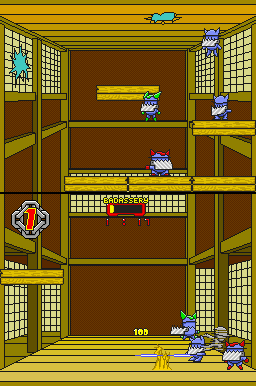 Fight on both screens to kick the monsters out of the dojo before your master comes back. Use your shuriken and dashes to increase your chains and fill up your 'badassery meter'. When your chains go high enough you can activate 'rumble time', which allows you to chain even more precise. Music by András "slyspy" Kövér.